Way back when, my grandpa was one of the few people that had a car in this small town. He bought an old blue jalopy for $100 from a military serviceman being sent overseas. The old car had a few dents and dings but most of the time, he says, it ran good. My grandpa drove to Red Crow Drive-In in his old blue jalopy and was instantly smitten with a beautiful young car hop with flaming red hair and dimples. He testifies to love at first sight. They dated for six months and then eloped. This woman happens to be my wonderful grandmother who had six children and eighteen grandchildren. And to think, I am here, on this earth, because of an old blue jalopy. 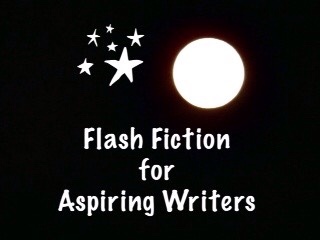 This is my 125 word submission for the flash fiction challenge, Flash Fiction for Aspiring Writers. We are given a photo prompt and approximately 75 – 175 words with which we create our stories. The challenge is fun and addicting and is open to all who would like to participate. For more information, click HERE. Click on the blue froggy button below to read some amazing stories for this challenge. This was a great story Joy, and if it is actually true, even a better one. Damn, you did crush me a bit. Would have been nice if it was true. Yet, the beauty of fiction. Oh, I’m sure that somewhere in this world it is true, just the name of the Drive In would change and maybe the amount of $ paid for the car. The name, Red Crow, is true. It was the name of a Drive In (the only drive in) in the town I was born and raised in. This was before Drive In’s became the rage. I loved this story and wondered if it was true, but read up there it is not! wow you certainly had my attention! Awesome story! LOL! I’m so glad you enjoyed it Lynn. Thank you so much! I loved it and forgot it was fiction! Yes, indeed! 🙂 Thank you so much Sonya! Like many folks, I thought there was more fact than fiction in your story. Sign of a good tale, you forget it’s a tale. Thank you so much! That makes me feel good. 🙂 Thank you for reading! Thank you so much Ameena!! 🙂 Happy February! That was a wonderful Pic too. Oh dear, did it not come across as a story? You are PriceLESS and JoyFULL too. I wasn’t quite sure what you meant. Thank you for the kind comments. Maybe you meant, it sounded more like a true story than fictional?? True stories can be fictional and vice versa. It shows your capability to make it so happen. Thank you Shiva. 🙂 Bria, is the name of my little dog. I was a bit proud having to know your name. I had commented to you in reply about your Dog making horrible sounds at night and disturbing you, that is on Deb’s post in which you have told about it. I hope you have read it. Once again I beg your pardon. PJ! as she addresses You. I know you are Dear! You didn’t offend me at all. I don’t offend that easy. My little dog is actually a very good, well mannered dog and most of the time very quiet. I guess I didn’t read the comment you made to Deb about her. May be the reply might have gone to her. She did reply on that, we had some awesome talk about that. Go read it. I will have to see if I can find it. I found it for You, here it is. Check the previous one where you have commented on its odd hours of calling. Thanks Shiva! I’ll check it out this afternoon. That’s wonderful that you rescued some street dogs! I think dogs know when they have been rescued and become better pets than dogs that haven’t been rescued. Bria might have been too young to know that she had been rescued. She’s a little old lady now and really is a well behaved dog. Yes, she is pretty. LOL! Great story! People used to believe in love at first sight, it makes such wonderful stories! Thank you so much Alixa! Thank you for reading and for your wonderful comment! Cute story. There were a lot of grandparent tales with this prompt. I noticed that too, Nortina. I can’t lie. I couldn’t help but wonder that myself. LOL!! Thank you Deborah. It is really strange, the stories that come into our brains when we see a photo. It was fun to write. Awww, bless the old blue jalopy. He brought love to all. Cute. Neat how that car was how Grandpa meant the Grandmother as a Car Hop. Great job. Thank you Mandi! I appreciate you reading and your comment! May I point out an error in your comment? I hope you don’t mind. When you use meant, I think you mean to say “met.” Met is the past tense of “meet.” “Meant” means, “Well, I ‘meant’ to say such and such, but I said, this and that.” “Meant” is the past tense of means. (I “mean,” I “meant.”) Does that make sense?? I hope I haven’t offended you. If I have, please forgive me. After awhile you won’t have to think about it. I don’t know it’s been years lol. This may sound stupid, but try writing a page with sentences with the correct word (words), and it will become easier for you to remember. You can use the same sentences if you want. No it’s a good idea. Thanks. Thank you Mandi. That is kind of you to say. Yes, there are entire stories still untold. The story of grandma and grandpa – of them having children and raising them, and their children having children… For some reason, that picture made me think of the story I wrote. It is the sudden feeling of an inexplicable joy one gets when something romantic or idealistic occurs. What a wonderful word! I wish we had a word that meant those same things. I wonder if we do but we just don’t know what the word is? Thank you for your kind comment! Well then, we need to start using your word, kilig!!! LOL!! Yes! That’s right! Do ya’ll celebrate Valentine’s Day? Yes, it is quite a big deal here in the Philippines. It is a very ‘commercialised’ occasion here. How about in your country? The same. Very commercialized! But, it’s a fun thing! Hahaha! Yes, that is true! I don’t have a partner so I won’t get a valentine. Well serendipity strikes! 😀 Would have been a great story to tell one’s grandchildren, no? Lovely story. I was talking about the grandson telling his grandchildren lol! 😉 It could be a story that gets passed down the family, that they all exist because of a blue jalopy!! Ooops, Sorry!! I had Just woken up!! 😀 😀 Funsie!! Yay!! How’s your uncle and granny? Thank you Maria! I think you are right, some people probably have stories that are similar to this one. Sweet story! People meet in so many different and random ways. Thank you Ali! You are right. People do meet in all kind of different ways. I love the details you pack into this short story–like the military man, the drive-in, and the dimples. Those are what make the story have life. It sounds true! Thank you so much Amy! Thank you for reading and for your wonderful feedback! Very believable. Nice job with the prompt. Thank you Susan! Back then $100 was a lot of money. LOL! Haha! You do know this is fiction. Right?? I really love the way you took an inanimate object and gave it a history. 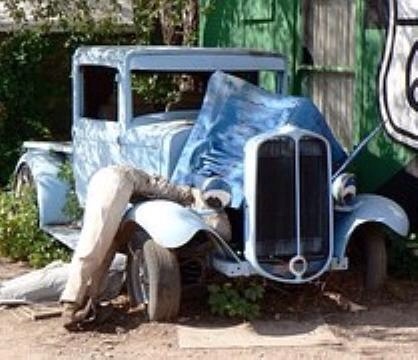 There is something very poignant in the way we attach meaning to things–like an old blue jalopy. Haha! Modern day did come and ruin a good thing! LOL! Thank you for reading Yolanda! Good one, PJ. Look at all the comments you have! Indeed a popular post and challenge! Thank you Terri, it was a fun one to write. What a beautiful warm fuzzy story 🙂 Good job! Sweet story, PJ. 🙂 That old blue jalopy played an important role! Thank you Jacqueline! I have to struggle to write because It has been so long since I have taken creative writing and I am by no means worthy of having something published. I just do it for fun. I think you sell yourself short by far. This read so perfectly to me. Oh, thank you Jacqueline. I appreciate that, very much. Thank you, Jessie. That is so true. Cars can become meaningful in many different ways.